Borrowed from Latin dens (“tooth”). (anatomy) The strong odontoid process of the axis. “dens” in Diccionari de la llengua catalana, segona edició, Institut d’Estudis Catalans. From Proto-Italic *dents, from Proto-Indo-European *h₃dónts. 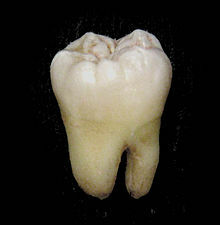 Cognates include Ancient Greek ὀδών (odṓn), Sanskrit दत् (dát) and Old English tōþ (English tooth). They have swords for teeth. Borrowed from French dense, Latin densus. Compare the inherited doublet des.